Review copy snagged off the ARC shelves at my place of employment. Content: There’s some violence — demon attacks and all — and the content is a little mature for younger readers (well, A tried reading it and lost interest). It’s in the YA section (grades 6-8) of the bookstore. Casey Kent has cancer. It’s in remission right now, but it’s forced her to re-think her extreme lifestyle. No more free jumping. No more trick boarding. In fact, everyone — from her parents, to her older sister, to her best friend, Kyle — is pretty much making sure Casey stays in a safe bubble. And it’s driving her insane. So, she decides to try out for one of the junior roller derby teams in town. Where she discovers that the coach (hot as he is) isn’t human. He’s a Sentinel, here to train people to fight demons. And it turns out that Casey, having been on the brink of death with her cancer, is the perfect hunter. 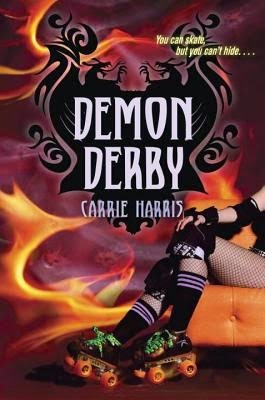 I was thinking this was Supernatural meets the roller derby and in many ways it is. There’s creepy demons trying to kill people, and this book will definitely make you rethink ever buying a bobble-headed doll again. But, it lacked (for me) a certain… oomph. The hot guy wasn’t terribly interesting, the danger not terribly exciting. It was all kind of … meh. What I DID like, however (and what kept me reading) was that this wasn’t your ordinary cancer book. Sure, Casey battled cancer and it’s in remission. But she was made strong because of it, not in spite of it. It was because of the cancer that she became an awesome Hunter and was able to defeat demons. And I liked that perspective. I also like that the person you thought would be the Traitor didn’t actually turn out to be one. It was a nice touch. I wanted to like it more than I did, but reading about Casey — who was strong and feisty and awesome — made it worth wading through the meh elements.